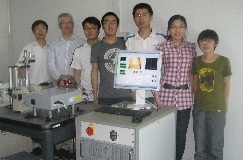 A NanoMOKE3 has been successfully installed in the Institute for Semiconductors in the Chinese Academy of Sciences, Beijing. The machine will be used to study domain wall dynamics and magnetic switching in a variety of thin magnetic films and nanostructures. The system is equipped with a high field dipolar electromagnet and a liquid helium cryostat.